Do We Have Another Year With Super Mariota? Last night’s loss to the Buckeyes was a painful one that, as much as we would all love to forget, will not be erased from our minds any time soon. Despite golden opportunities handed to Marcus Mariota by the defense forcing four turnovers, they couldn’t capitalize against a strong Ohio State defense. So, is this the end of the Mariota era in Eugene? Have we seen the last of who many are calling the greatest Duck ever? According to an ESPN.com report we may have not seen the last of super Mariota. After the game he was reported as saying, “There’s grad school, coming back another year to improve. There’s a lot of other things that could bring me back. It’s not just specifically this loss.” This may be nothing more than the nicest player in the country giving us fans some hope, softening the blow of the loss without reminding us we are losing him too. But, what if Mariota did return for his redshirt senior year? True, it would be near impossible to duplicate, much less top, his performance this season. En route to winning the Heisman Trophy, Maxwell Award, Davey O’Brien Quarterback Award, and Walter Camp player of the year Award (among others), Mariota lit up the stat sheet with 68.3% completion percentage, 4,454 yards, 42 touchdowns to four interceptions, and 770 yards with his legs. 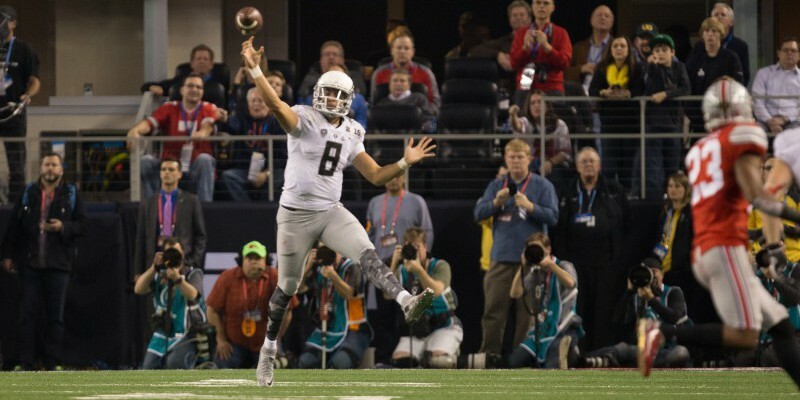 But, Mariota is a student of the game and knows that there is always more to learn, even for a Heisman winner. Mariota will be losing key components of his offensive line next year as well as some of his weapons, but if this season taught us anything, it’s that the Ducks are always ready to have the next man up. Losses on the offensive line will be hard to overcome, but the Ducks should be able to retain most of their brightest stars, young players such as Royce Freeman, Devon Allen, Dwayne Stanford, and Darren Carrington. Mariota has until Thursday to make his decision, and regardless of where he decides to continue his career next year we should all remember what an honor it was to watch him lead this Ducks squad through thick and thin into the inaugural College Football Playoff National Championship.